Tevia Feng began martial arts, Qigong and meditation training at the age of 7 years old. He has personally taught hundreds of students from around the world, and has taught in various countries around the world including China, and the US. training in the internal martial arts and Qigong. 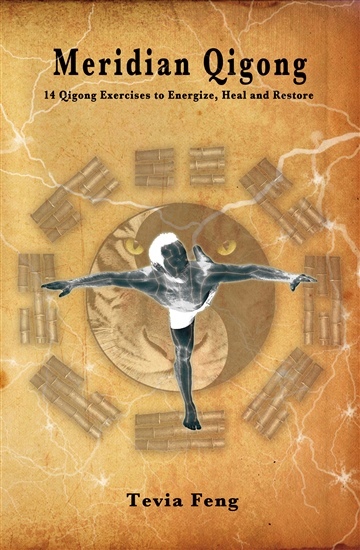 He is the author of the bookMeridian Qigong. He has since studied with a variety of masters including Daoist Abbot Luo Pin Cho (Tian Ji Dao Sect), Narcyz Latecki under Master Liang Shou Yu, Master Yuan and Master Chen Si Xing (Sang Feng Sect), Dr. Yang Jwing Ming, Master Kenneth Cohen, Dr. Ming Wu, Master Zhang Yuxuan. He is also authorised to teach Qigong/Baguazhang of the Tian Ji Dao sect in Hong Kong and mainland China. He is a 7th Generation Wudang Mountain Baguazhang Disciple. He graduated Tactical Awareness School under the instruction of a famous former Navy SEAL Team 6 member, training in wilderness survival, forest combat, wild edibles, animal tracking, animal trapping, cold water meditation training, camouflage, telepathy training and more. He has lived and traveled throughout China from Beijing to Taiwan studying in Qigong, rare forms of Qigong, Xing Yi Quan, Wing Chun and various styles of Baguazhang. While in China he also studied at several Taoist monasteries and temples, with various martial arts masters, hermits and Taoist masters studying Golden Elixer Qigong, Medical Qigong, Esoteric Baguazhang and more. A Medical Qigong Practitioner Who Has Effective Results With Cancer Patients Tevia Feng is a certified by Dr. Ming Wu as a Medical Qigong teacher and practitioner. Dr. Ming Wu also trained and certified Tevia in Tui Na (a medical Qigong acupressure therapy), fire cupping, and magnetic cupping therapy. He has since worked in Dr. Wu’s Chinese Medicine clinic in Guangdong Province, China practicing Tui Na and teaching Medical Qigong to physically handicapped and terminally ill cancer patients. He has had 100% positive, effective results with every single person he has worked with. Tevia Feng’s Vision His vision is to spread these sacred arts across the world so others can learn to heal, transform their lives and discover their human potential. He currently offers Qigong, Medical Qigong, Internal Martial Arts, and Taoist Warrior Mind Training workshops and, teacher certifications and classes worldwide traveling to various cities across the world.